The DOC campground at Matai (or Maitai) Bay describes itself as being ‘nestled among beautiful pohutukawa trees’ and it certainly is a lovely spot. From our bus, we had views of Ohungahunga Bay, the northern part of Matai Bay, and just a few metres in the other direction, there was a walkway down to Waikato Bay. 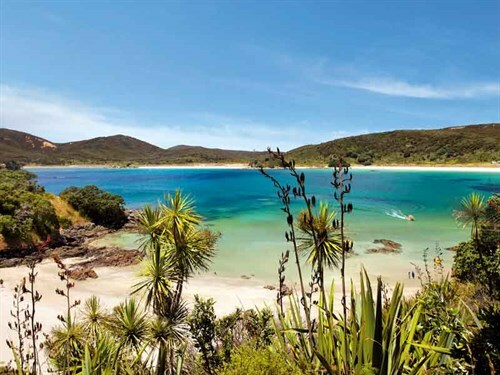 These two bays have curved, sandy beaches divided by a spit of land and together make up Matai Bay. The campground is a perfect base for those who want to get away from it all. 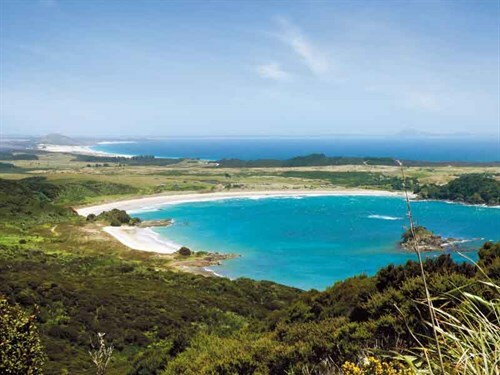 It’s on the Karikari Peninsula in the Far North, 44km from Kaitaia and is one of those places that seem as if it’s a million miles from anywhere. Fishermen launch their boats to try their luck in the bay or out in the open ocean, while others scramble out onto the rocky headlands. 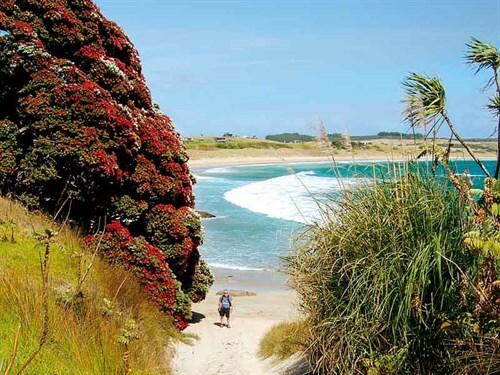 Families enjoy the protected sandy beaches and picnic in the shade of the pohutukawa trees. 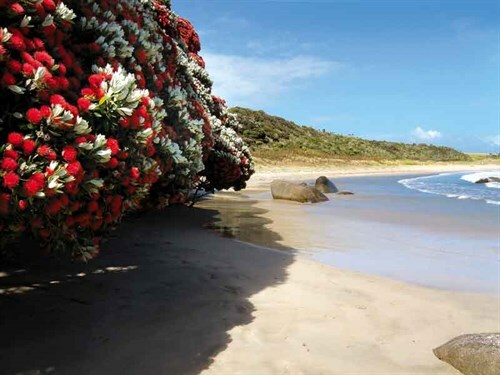 When we visited in peak summer, the whole of Waikato Bay was a blaze of colour and the stamens that had fallen from the pohutukawa flowers lay in scarlet drifts on the sand. It’s a safe area for swimming and the snorkelling around the rock pools off the headlands is very good. We enjoyed exploring the walking tracks leading from the campsite. 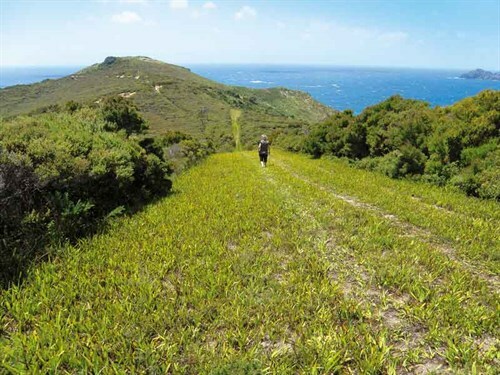 The Matai Bay Headland Track, which leads from the campsite across farmland, is a great short walk at around 3.45km return. We did the track in about 90 minutes, allowing plenty of time to enjoy the stunning views over the bay area from the track and also from some of the little coves at the end of the headland. The longer Fig Tree Track walk is even more amazing. 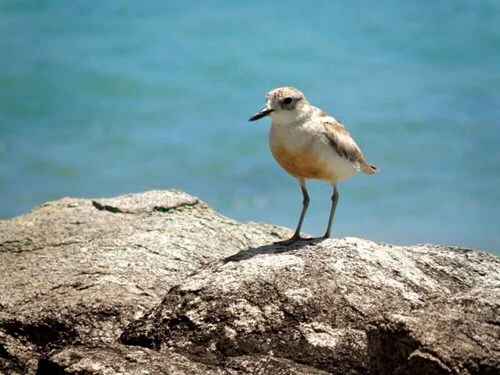 It includes a walk along the beautiful Waikato Bay Beach where you can admire those pohutukawas and keep an eye out for endangered New Zealand dotterels, a stroll through shady bush beside a stream, and a trek up an exposed hillside to the top of Paraawanui. The views from the summit are splendid. We could see down to Matai Bay and clear across the Karikari Peninsula to the sweep of beach at Karikari Bay. In the distant haze, the mainland stretched north towards Cape Reinga. 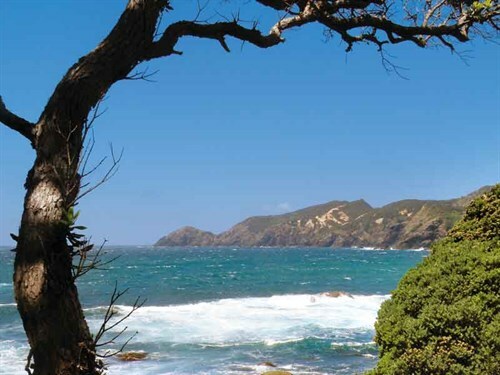 There is the option of retracing your steps from here or continuing down through bush to the exposed wildness of Whangatupere Bay, where the sound of waves breaking on the rocky shore and the cries of gulls are the only things to be heard. Back at the high point, we discovered an alternative route to the campground by way of dizzying cliffs and a pretty track through woodland. There is more to discover on the Karikari Peninsula. The Matai Bay area was once an island: to the south, it’s connected to the mainland by a low-lying sandy strip with gorgeous beaches on both sides. Tokerau Beach is the longest, stretching for 18km, and is a favourite spot for surfcasters. The little settlements of Tokerau Beach and Whatuwhiwhi have motorcamps, and the scattering of baches are filled with holidaymakers in summer. On the other side of the peninsula, Karikari and Puwheke beaches are separated by the grassy Mount Puheke. There are sweeping views from the summit, looking out at Cape Karikari and the Moturoa Islands. At the base of the peninsula is Lake Ohia. This former lakebed reveals the effects of gum digging. The area was once home to diggers from Croatia. Now there is a boardwalk and metalled track among the excavations. A grapevine was planted here back in those days and its successor, New Zealand’s most northerly vineyard, can be found close by. The Karikari Estate Winery has a cafe and cellar door. A glass of the local wine while watching the soft evening light would be a great way to end a day at Matai Bay.